The below artworks are the most important by Oskar Schelmmer - that both overview the major creative periods, and highlight the greatest achievements by the artist. Artwork description & Analysis: Schlemmer's reliefs mark a half-way point in his exploration of the human body from two-dimensional paintings to three-dimensional sculptures. His negotiations with Cubism are also apparent as he divides the human figure into geometric sections. The viewer sees the figure from the front and the rounded shapes denoting the head, torso, and legs are intersected with horizontal and vertical gridlines. These elements of the body are raised from the surface, but also delineated through the use of metallic paint in black, brown, silver, and bronze. Patterned sections make the figure stand out from the surface and offer more depth to the relief. Artwork description & Analysis: The tubular shapes of Abstract Figure resemble the standing human form with arms outstretched. 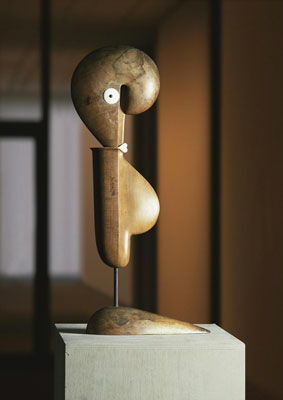 The streamlined body can be seen as that of the New Man, a fantasy figure in post-war Germany who was thoroughly modern and forward-thinking. 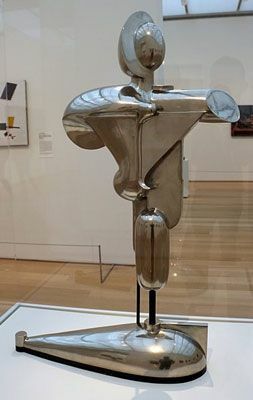 The use of bronze and nickel reflect these notions and give the work a machine-like aesthetic, an idea that was explored by staff and students at the Bauhaus, where Schlemmer was teaching at this time. The inter-disciplinary environment of the school meant Schlemmer could easily access the resources and materials of the metal workshop to create this piece. Abstract Figure was one of Schlemmer's first forays into expressing the human figure in three-dimensions. Following the First World War, Schlemmer increasingly placed an emphasis on the more spatial aspects of his art and how the dynamism of the human body could be displayed through sculpture and theater. Of such experiments, the artist wrote: "Sculpture is three-dimensional. It cannot be taken in at once, but rather in a temporal sequence of different locations and angles of view. As a sculpture is not exhausted by a single direction of view, the visitor is forced to move, and it is only the circumambulation and the sum of impressions that leads to the full experience of the sculpture". Artwork description & Analysis: Schlemmer's ballet premiered at the Stuttgart Landestheater in September 1922, with music by the German composer Paul Hindemith. The production went on to tour throughout Europe in the 1920s, to cities including Weimar, Frankfurt, Berlin, and Paris, spreading the Bauhaus ideas of modern art. The ballet didn't have a plot, but rather three acts of different moods and color which Schlemmer described as a "party of form and color". Act One was yellow, Act Two, pink, and the final Act was black. It was performed by three dancers, two female and one male, who wore a total of 18 costumes. The costumes over-emphasized the forms of the human body, turning the dancers into geometrical constructions and they moved both with and against the wearers as they danced the ballet, restricting some movements and highlighting others. The mixed media of their construction variously reflected and absorbed light further emphasizing certain body parts and structural elements. Schlemmer was not the first to explore the traditional dance form of ballet in a modern way. At this time, the Ballets Russes, founded by the Russian art patron Sergei Diaghilev, was at the height of its popularity. 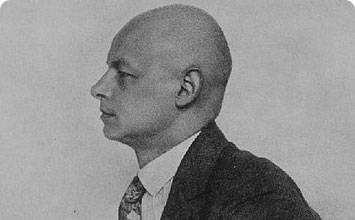 Diaghilev commissioned new music from the composers Igor Stravinsky and Sergei Prokofiev, accompanying by sets designed by Henri Matisse, Pablo Picasso, and Schlemmer's Bauhaus colleague Wassily Kandinsky. In the Triadic Ballet, however, Schlemmer was the first artist to fuse dance and modernism through his exploration of abstraction in real space. It also marked a breakaway from classical ballet's focus on the soloist and the duet, instead emphasising a collective approach to dance. Schlemmer described his attempts to explore the relationship between body, shape, color and space as "artistic metaphysical mathematics". 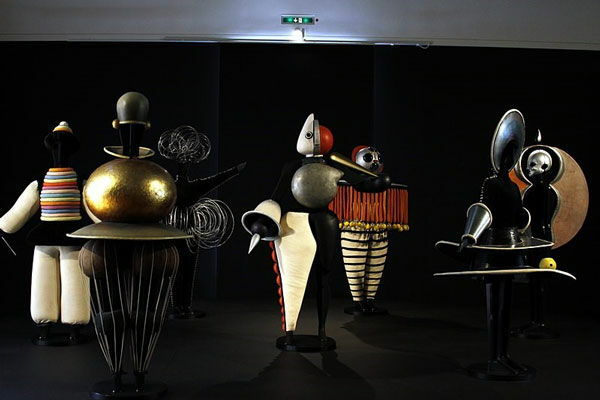 As well as the physical movement of the dance, the costumes can be seen as a living embodiment of Schlemmer's previous sculptural and pictorial work. The performers appear machine-like in their faceless costumes, reflecting on the zeitgeist of the New Man. Photograph of seven of the original Triadic Ballet costumes. Costumes are mixed media, predominantly metal and fabric. Artwork description & Analysis: Schlemmer's Grotesk I shows a greater level of abstraction than most of his other work. Indeed, it is only discernible as human by the inclusion of the large ivory eye and mouth. Designed by Schlemmer and carved from walnut by Josef Hartwig, the Technical Master of the stone-sculpture and wood-carving workshops at the Bauhaus, the process of its creation demonstrates the collaborative working practices at the school. The sculpture takes the form of sweeping curves in a large S-shape, delineating the upper and lower body. The piece can be seen as an exploration of the materials from which it is composed, contrasting the figure's curved shape with the firmness and solidity of the wood and the patterned grain of the polished surface. Built onto a metal pole which acts as a spine, the figure can swivel, changing the relationship between the body and its foot-like base. 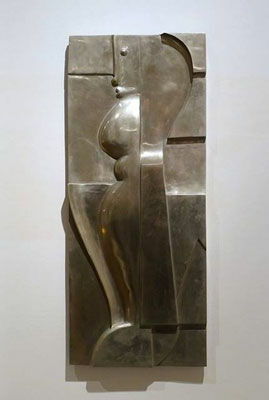 This ability to see the sculpture from a range of angles, allows the viewer to consider the human figure and its relationship to its environment in a fluid and dynamic way. The title also sets it apart from his other work in that it directly references its quasi-human qualities. Schlemmer mixes natural materials with exaggerated forms to create a sculpture that is both attractive and repellent, depending on how the shapes are interpreted. The piece may have been a response to an exchange between Schlemmer and Swiss artist, Otto Meyer-Amden. 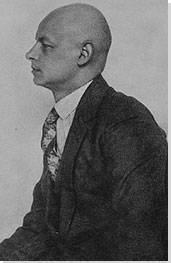 Meyer-Amden suggested that Schlemmer's biggest talent was in the production of grotesque imagery, an accusation that Schlemmer rebutted, stating that: "I always defended myself against the grotesque. I wanted to be at the edge but still avoid making the sublime ridiculous". This figure was first exhibited a few weeks after this discussion. Artwork description & Analysis: Based on a sketch from 1921, here Schlemmer depicts several figures looking in all directions, yet consciously ensures that all of them avoid the gaze of the viewer. These non-gendered faces are a common theme in the artist's work, presenting humans as statue-like, mechanical creatures. The background creates an abstract pictorial area through four rectangular planes of sombre hues. This marks an unusual departure from the colorful geometry of many of the paintings and designs of the Bauhaus. The image is a study of multiple forms and their relationship to each other, focusing on the spatial positioning of the figures. The outstretched hands of two of the middle figures suggest they are exploring the undiscovered space of the painting, whilst the white gap at the top of the canvas features a small silhouette of a figure, hinting at an open doorway, or that the space has further unknown depths. The bodies and limbs of the figures seem to radiate out from the bald-headed figure in the near-middle of the canvas, giving the work its title. 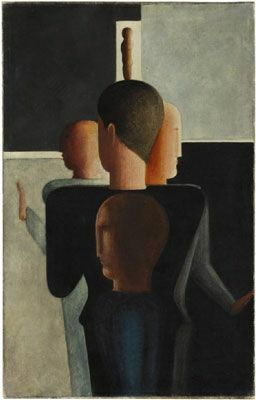 The physical similarities between this figure and Schlemmer possibly suggest that the artist has portrayed himself at the center of his own work, the point around which the other figures gravitate. The piece was created as part of a group of works in 1925, when Schlemmer was at the height of his career at the Bauhaus. All of them sold quickly to private collectors and museums, helping to make his name internationally. This led to Schlemmer nicknaming them the "gallery pictures". This was one of Schlemmer's works that was designated as 'degenerate' by the Nazis. Artwork description & Analysis: Unlike the imaginary architectural spaces of his other paintings, in Bauhaustreppe Schlemmer depicts a real place: the staircase in Walter Gropius's Bauhaus building in Dessau. 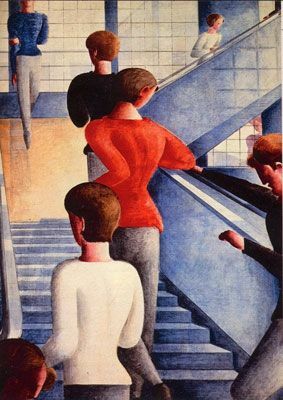 Based on a photograph taken in 1927 by T. Lux Feininger of students leaving a class, Schlemmer uses the geometrical construction of the staircase like a stage, positioning figures in a carefully choreographed scene. The grid structure of the windows is continued throughout the picture, bringing into play a mathematical element seen in other works by the artist. The use of bold primary colors paired with the strong geometry closely ties the piece to the wider Bauhaus style. Schlemmer painted this work three years after leaving the Bauhaus and it can be seen as both a farewell to the school and a protest piece against the forced closure of its Dessau site, which was announced in July 1932. He described the painting in a letter as his "best work", and it was to be the last major painting of his career. Schlemmer was not the only artist to tackle this topic, Yamawaki's collage, The End of the Dessau Bauhaus (1932) depicts a uniformed Nazi and a politician marching across the Bauhaus buildings. Schlemmer's work is less overtly political, however, and instead presents the schools as a lost utopia of purpose and learning filled with ordinary students, their contemporary clothing and haircuts grounding them in the present. The painting became a symbol of the impact of the Nazis on art and the image's iconic status was affirmed when Roy Lichtenstein produced his own homage to the work in 1989. Despite the use of a non-imagined location, Schlemmer is still able to experiment with the movement of bodies in space with the unlikely perspectives and inclusion of the mysteriously floating figure at the top of the stairs. This en pointe ballet dancer challenges the viewer whilst introducing a dance element, reflecting Schlemmer's love of theatricality and movement. The descending dancer may also represent the hope that the difficult political period would come to an end and that the school and its activities would find a way to persist, an almost angelic presence amongst the more mundane daily activities of the other figures. The people in the picture are similar to those seen throughout the artist's career - modular and faceless.